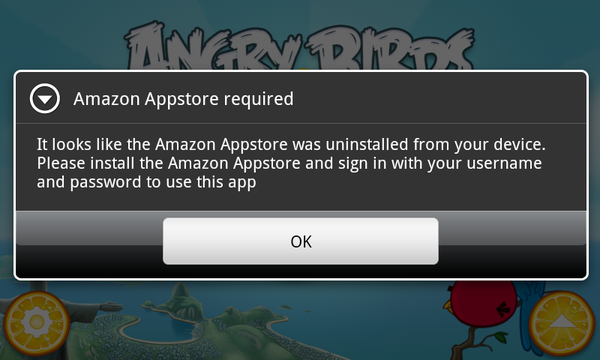 If you installed the new Amazon AppStore this morning to grab Angry Birds Rio, you might not want to uninstall it any time soon. If you do, and then try to play AB Rio, you’ll see the following message on your screen. It looks like the Amazon Appstore was uninstalled from your device. Please install the Amazon Appstore and sign in with your username and password to use this app. Smart move by Amazon, but frustrating to those of you out there that don’t want an extra appstore app taking up space on your phone’s internal memory and in your app drawer. Kids got to make money somehow, right? Hopefully this isn’t a trend with all of their apps. Cheers @davekover and everyone else!